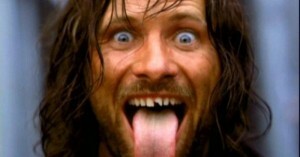 This pic might be totally out of character with honoring Viggo but then again it is still him - so him at times. For those who were around for the Orlando Retreat (way back ages ago) remember that this picture was taped to the front door of the main suite. The memory of that and another LJ LOTR fan came to mind. I missed her birthday yesterday alliwantisanelf which is terrible since it is the same as mine and I got so caught up in the celebration that I forgot to post a birthday greeting. Happy Belated Birthday alliwantisanelf Hope it was a good one. I miss you birthday twin. So back to the story - the picture was taped to the outside of the door and a repairman came by to fix something or other and asked who that was. alliwantisanelf replied in a very serious and reverent voice. "That, is the king." We had trouble keeping the snickers under control as the repairman stares at us and then the picture with confusion and then a little bit of awe. It was fabulous! I remember it well - it was such a great weekend! *laughs* It was. Some really great memories there. Belated Happy Birthday! Hope you had a fantastic time! It was one of several. Wish you had been there too. It was the beginning of some awesome friendships but even if we never meet in person that friendship develop and live. You stay safe, I'll be thinking of you in the coming days!